Responsible Research and Innovation (RRI) is a framework that aims at integrating the shared European values, the needs and the expectations from the society into research and innovation practices. The RRI approach aims to tackle the Grand Societal Challenges (see more information here) which have been identified by the Commission. The RRI approach includes such initiatives as an intense discourse about the relevance and the use of the outcomes and consequences of research and innovation in the society, invitation of the general public to participate in activities related to research and innovation (rather than a one-way science communication about the results), addressing sustainability and inclusion (with special respect on gender parity) in the design, process and with the results and the communication of research and innovation activities and providing open access to explanations and descriptions. These aims of RRI can be summed up as 6 thematic elements: governance, public engagement, ethics, open access, gender and science education (see Fig.1). 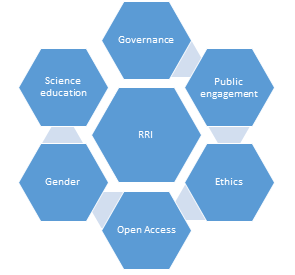 RRI can be viewed as a new governance approach to research which in practice involves a) ensuring gender equality, b) taking the ethical implications of research into account, c) promoting science education, d) engaging society more broadly in the research process and e) increasing access to scientific results. Still, there is not an overall consensus what RRI entails and how to measure its impact. No-one will provide a cookbook-recipe to show „how RRI is meant to be done”. Rather, it encourages each EU project and initiative to reflect on how they can define RRI in their work and in their communities’ contexts. Ark of Inquiry project focusses explicitly on one of the previously mentioned 6 elements of RRI, namely science education, as a chance to integrate all previously mentioned RRI aspects. The Ark of Inquiry project aims to foster RRI by teaching pupils core inquiry skills needed to evaluate the credibility and consequences of scientific research and by offering opportunities for pupils to engage with different societal actors involved in the research and innovation process. It is important that pupils experience inquiry activities outside of the formal educational setting and become aware of the broader community of people involved in research and innovation. Pupils who have an early opportunity to interact with a broad audience of stakeholders will be better prepared later as citizens to debate and think about scientific issues with an open and critical mind considering what have been mentioned as typical RRI aspects such as the global and sustainable impact of research findings and innovations in which positive and negative consequences are balanced, societal relevance, and the importance of participatory design and co-creation with end users (Sutcliffe, 2011)2. See more here about our approach to RRI. 2Sutcliffe, H. (2011). A report on Responsible Research and Innovation. Paper based on DG Research Workshop on Responsible Research and Innovation in Europe, Brussels, 16-17 May 2011. „Ark of Inquiry: Inquiry Awards for Youth over Europe“ is a project on teacher training, oriented towards raising science awareness, particularly that of youth aged 7 to 18, to Responsible Research and Innovation, (RRI). It is a coordination and support action under FP7-SCIENCE-IN-SOCIETY-2013-1, ACTIVITY 5.2.2 Young people and science: Topic SiS.2013.2.2.1-1 Raising youth awareness to Responsible Research and Innovation through Inquiry Based Science Education. This project has received funding from the European Union’s Seventh Framework Programme for research, technological development and demonstration under grant agreement no 612252.